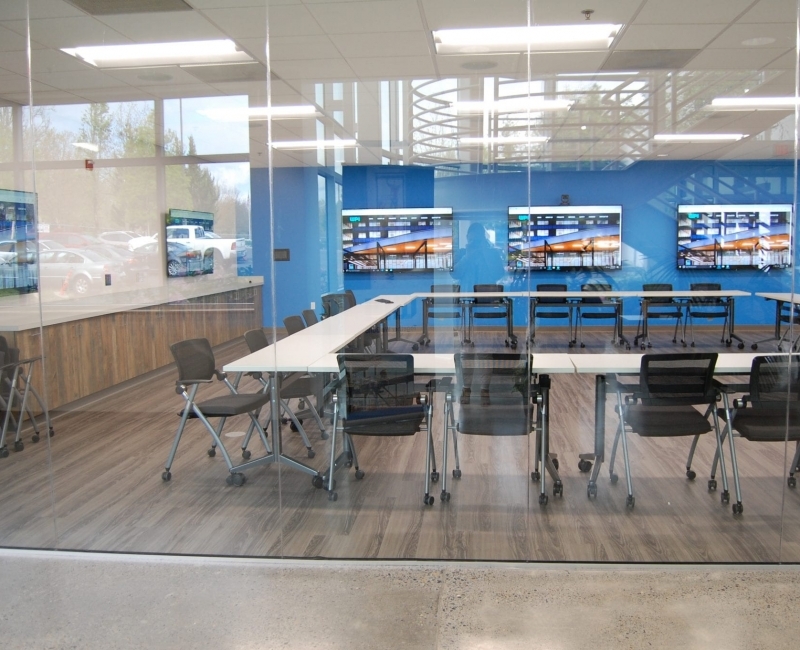 LightWerks Communication Systems was honored to be selected for a design build project at the WPI Headquarters in Wilsonville, Oregon. Western Partitions Inc. (WPI) is one of the largest commercial construction contractors providing interior solutions in the Northwest. 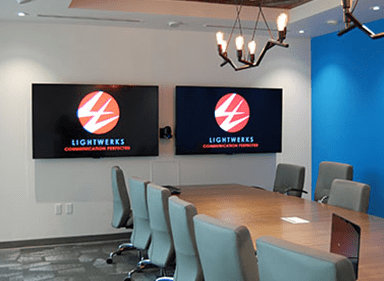 They came to LightWerks in search of Audio Visual solutions and integration of their reception area, employee lounge, training room, and conference room. The goal was to design a cutting edge space that allowed for maximum flexibility in an effort to drive brand awareness and customer awareness of WPI projects. 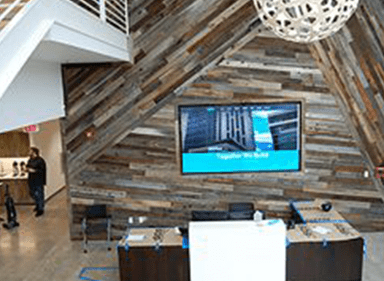 LightWerks installed a 2×2 Christie Digital video wall at the front reception area and paired it with a BrightSign digital signage player. The video wall showcases recent WPI projects and allows them to welcome clients with a personal message. The training room is a showcase piece designed for maximum flexibility and use. It is used to host clients and multiple displays allow sharing multiple images and projects on different SHARP displays. The room is also used for Safety Training and is equipped with a USB camera, Audix ceiling microphones, and a PC running ZOOM for connections to all the other job trailers, WPI offices, and site superintendents. The room is equipped with flexible tables and chairs so it can be set up in different configurations. LightWerks installed laptop inputs in multiple places and added a Mersive Solstice POD which enables the users to connect wirelessly from any device. The entire room including the lights is controlled by a 7’’ wireless Crestron touch panel. 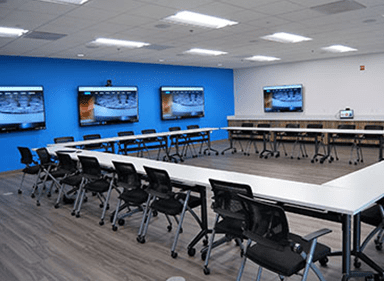 LightWerks also installed AV equipment in a conference room with traditional table inputs, ceiling speakers and an in-table Crestron touchpanel as well as a flat panel TV and sound bar in the employee lounge for music and presentations. To enable an environment where flourishing ideas can come to life, Lightwerks creates a versatile and reliable audio visual solution that suits your unique needs and space. We have a wide range of audio/visual solutions which include multiple monitors, projector and screen, web conferencing, total control systems and integrated audio & video. Contact us at LightWerks today for more information on what we can do for you or your organization or fill in below form!